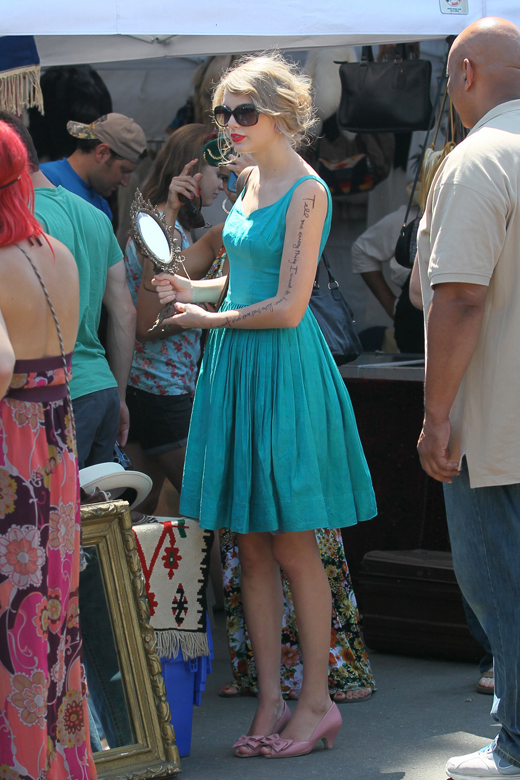 Taylor Swift was spotted over the holiday weekend at the Fairfax Flea Market wearing a vintage dress from Salvage Life! I love that she is wearing is wearing one of our pieces while doing my favorite activity, warms my heart! She really does look perfect in the 50's silhouette, and jewel tones are especially flattering. Thanks Tay for making our clothes look so good! That must be so exciting! Have you had an opportunity to meet her, or to style her? Maybe she would get a hint to get more dress from you. She looks good in Salvage Life. :) How fun for you.